How Much Data does Your Child Use Per Month? Teens ages 13 to 17 use on average 320MB of data per month? 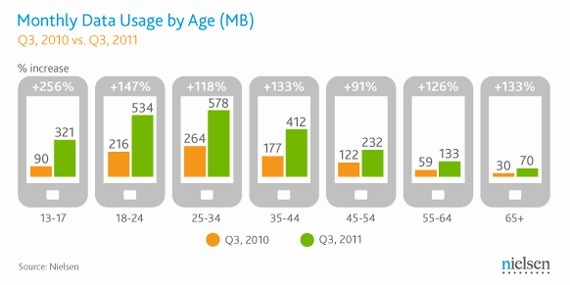 Adults ages 25-34 use on average 578MB of data per month? A study by Nielson analyzed mobile data from 65,000 U.S. subscribers. Smartphone users using mobile internet has increased 45% this year. Take a look around. Before the iPhone revolution, who among the people you know had smartphones? Very few people I imagine. Teens & Texting: Where are Thou Social Skills? We’ve had many article here following the incredible growth of text usage among teenagers. During Q3 of 2011, female teens had reached 3,952 texts per month. Male teens were at a “paltry” 2,815 per month. It wasn’t long ago that I was fine with a 200 txt msg plan! Not anymore. Some people argue that social networks and easy communication access is lowering children’s ability to socially connect with others. Well this latest crop of statistics show that voice minute usage is dropping among teens. it dropped 17% year over year as they opt to text as it is faster and easier. An older poll from 2011 of 500 social networking Americans between ages 13 to 21, showed that 71% of the respondents preferred texting to phone calling. Ok, confession time. I would fall in that category as well. It is indeed easier and quicker, but do you think it has an adverse affect? Will it hurt social abilities and limit experiences for children and teens who grow up texting, talking online, messaging on Facebook, and IMing on gchat. I would argue, yes it would have an effect, though it may not be obvious or all that dramatic at first. I’ve worked with enough college students and youths to know, it could potentially become a problem. How Often Do YOU Text Per Day? The only time that I use a lot is when I stream Netflix movies through the phone network. Netflix movies are about 100 MB each! A smartphone is also capable of using a wi-fi network when possible. If you use wi-fi when it is available (it is faster than 3G), then it is easy to stay under 2GB per month in data use. This levels can reach very high numbers in many cases. Imagine downloading just one video game of 1gb and few Mp3’s ! For sure many teens do this things. I typically use less than 2GB per month. The only time that I use a lot is when I stream Netflix movies through the phone network. Netflix movies are about 100 MB each! A smartphone is also capable of using a wi-fi network when possible. If you use wi-fi when it is available (it is faster than 3G), then it is easy to stay under 2GB per month in data use.